From daily deal websites offering great deals on products for one day only to Click Monday and Click Madness, websites that bring many online retailers together for the ultimate online sale day – online shopping has gone discount crazy! The next craze to hit the world of online bargain shopping is Flash Sales, where websites offer you products at up to 80 percent off the recommended retail price. 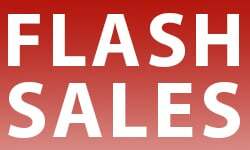 Just like a flash mob, these Flash Sales pop up from nowhere and are gone again in a flash! When you see these hugely discounted products you have to wonder if they’re really a bargain or is it too good to be true?